For those of you that are visiting us this week and over the 4th … here’s the activity schedule. Fireworks you ask. You may set off your fireworks by the lake, near the beach area only. If you’d like to see the fireworks at Holiday World & Splashin’ Safari you may view those from the parking lot at Blitzen Bay, near Blitzen Kitchen and the Dasher bathhouse. Enjoy! 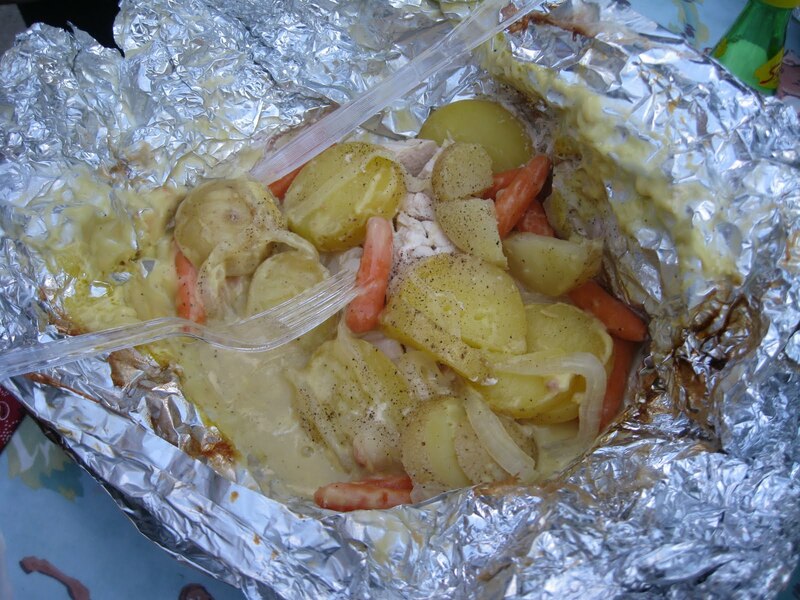 Rudy’s Recipe is Chicken Pot Pie … it’s a tasty (and easy) Dutch oven recipe for the campfire. Mix chicken, vegetables including liquid, and both cans of soup. Put in a Dutch oven and warm over coals. Do not boil! When warm, place biscuits on top of chicken mixture and cover with lid. Place a few coals on the lid. Check it after 15 minutes. Cook until biscuits are done. Usually takes about 30 minutes. This recipe serves 4 … double it if you need more! After a few of our guests asked us what they should remember to bring for the rentals we thought we’d do a helpful blog post for our first-time visitors to Lake Rudolph. It doesn’t matter if you’re staying in one of our rentals or on a site; these are helpful hints. These are some great suggestions … they really know what they’re talking ’bout! This week Rudy’s Recipe is Hobo Chicken. I’ll never figure out the “hobo” part, but I don’t have to get it to enjoy it! You will need a strip of heavy duty aluminum foil wrap to make a bag (or get Hot Bags) for each person. Everyone can make their own meal by putting a chicken breast and the vegetables that they like in the bag, add the water and some seasoning salt, close the bag, put a name on them and put them on a hot fire pit for about an hour. Enjoy!!! – Recipe courtesy of KOA. Our activity schedule for this week is below. About a week ago I received an email from Jo, a lovely grandmother who was planning a visit with her grandkids. This wasn’t the first time they had camped with us … but it was the first time that her grandson, Sam, had asked for a green golf car. Of course, I told Jo that we’d try our best to get a green golf car for Sam, but no promises. We have been enjoying Lake Rudolph’s Rental RVs since our grandson was born! The last 3 years we have gotten a white golf cart. For some reason this year as soon as we mentioned Lake Rudolph and camping, the now 4 year old Sam says, “Grammy, I want a green golf cart this year.” He really enjoys the golf cart rides around the campgrounds. We usually rent a 6 seater so the entire family can go, his sister Cora is 2 years old and has gone to the campgrounds since before she was born! Sam had a special calender his Mom made to make the ‘wait’ for vacation easier for him. As the days were counting down his request for a green golf cart became even more and more frequent. What is a Grammy to do? Fortunately, I had joined Lake Rudolph on Facebook and saw a post containing the email address for Laura, who manages the page. So with just a few days before we were to arrive, I thought well it never hurts to ask. Laura immediately got things moving on our golf cart reservation to make every attempt to get a green golf cart reserved. The ladies at the call center and welcome center were aware of the request and helped with the surprise … I was totally excited to present Sam the key to the golf cart and assist him in the search for our cart in the golf cart parking area. He kept asking, “Is it green, Grammy?” I told him to look for the number and then we’d know. The look on his face when he found our #110 golf car was indeed green was priceless. I do not know why this green golf cart was so important to a 4 year old BUT I do know the folks at Lake Rudolph enabled Sam to believe in Santa’s magic! Thank you to all who made this simple, yet so important request possible. 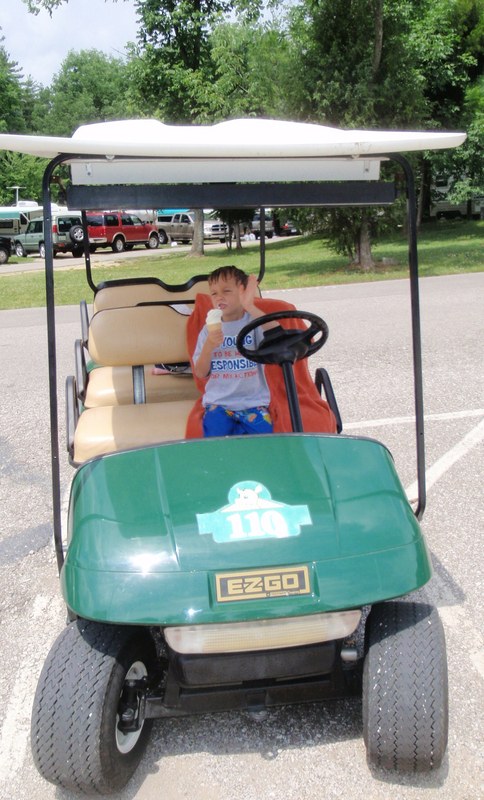 I have included a photo of Sam, “driving” his green golf cart and enjoying ice cream from Blitzen Kitchen. Rudy’s Recipe this week is Apple Pie on a Stick. This isn’t your ordinary ole’ apple pie. In a small bowl, mix together sugar and cinnamon and set aside. When the skin is loose, remove the apple from the coals but leave it on the stick. Peel the skin off the apple, being careful not to burn yourself because the apple is very hot! 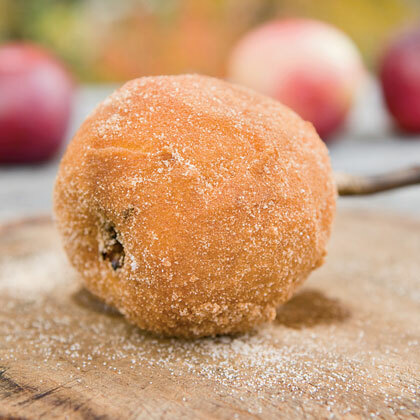 Roll apple in cinnamon sugar mixture and devour! 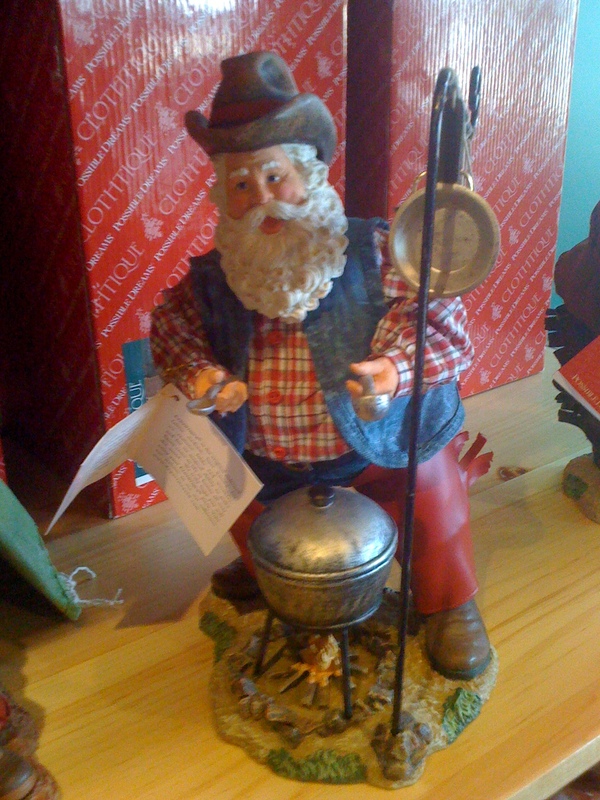 I was over at the Santa Claus Christmas Store last week giving a travel writer a tour and came across these two Santa collectibles. They’re made by Possible Dreams and we have a huge collection of them at the store. These little guys cracked me up. And they’re perfect for the camper in your family. 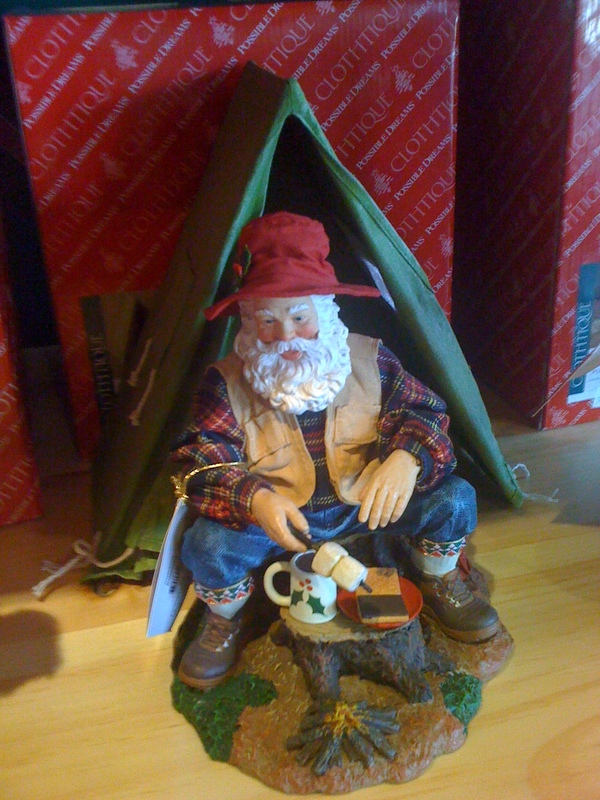 I mean, really, who doesn’t want a camping Santa? We held our 9th annual Open House today! I thought I’d share a few, fun photos. These babies will put a little hop in your step! Rudy’s Recipe this week is Spicy Chicken Skewers. Sprinkle chicken with salt and pepper, then combine all ingredients in a zip lock baggie. Place in cooler to marinate for at least 30 minutes. The longer it marinates, the better. Take wooden skewers and carefully place in bowl, sink or baggie filled with water … soak for 30 minutes. Remove chicken and thread onto skewers and grill until done. Tip: Make this in the morning and leave to marinade all day. When you get back for the night, you are ready to barbecue.